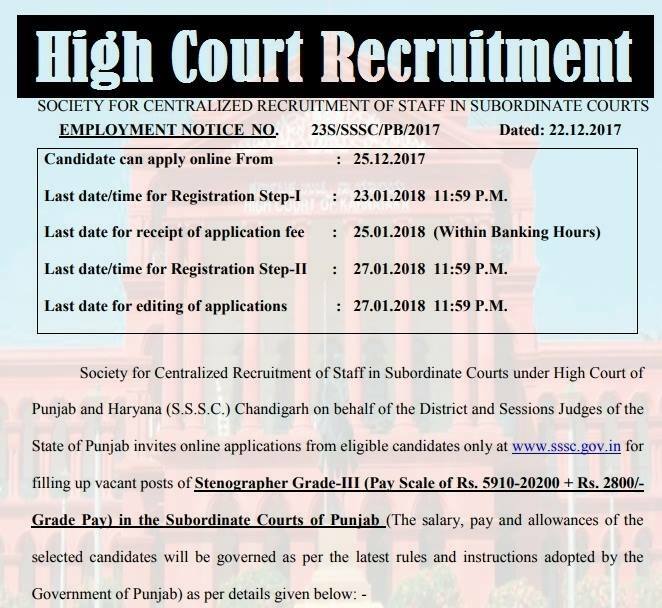 Apply online application to High Court of Punjab & Haryana Recruitment 2018 239 Stenographer. High Court of Punjab & Haryana Recruitment Board, latest notification for Stenographer. Applicants can get full advertisement below and submit the High Court of Punjab & Haryana online application at www.sssc.gov.in. Applicants who are going to apply, ensure that you are eligible for post of Stenographer. The applicants will have to apply online, no other option. The last date of submitting online application is 23.01.2018. High Court of Punjab & Haryana notification further information such as eligibility criteria, syllabus and how to apply etc. listed below. Education qualification: Matriculation Examination with Punjabi, Bachelor of Arts or Bachelor of Science or its equivalent qualification from a recognized Board / University. Selection: Shorthand Test and Computer Proficiency Test. Age Limit: Candidates minimum age limit 18 Years to upper age limit 37 Years As On 01.01.2017. Pay Scale- Rs.5910/ - Rs.20200/- With Rs.2800/- Grade Pay. Payment of application fee can made through Cash Deposit Receipt‟, printed after completion of Step-I of registration, in any branch of State Bank of India only. The „Cash Deposit Receipt‟ will contain the amount of fee to be deposited by the applicant, depending upon his/her category. Applicant approaching the State Bank of India Branch will ask for depositing the fee under Screen 8888 (Fee Type-21). No other mode of payment of fee is admissible. The fee once paid will not be refunded in any case. The applicant must retain the „Cash Deposit Receipt‟ in original for future use. 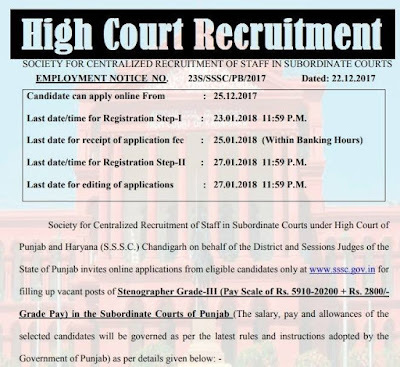 How to apply: Eligible applicant require to apply online through High Court of Punjab & Haryana Recruitment 2018 website www.sssc.gov.in from 23.01.2018. 1. Log on to the High Court of Punjab & Haryana website www.sssc.gov.in. 6. Make the payment by Cash Deposit Receipt‟, printed after completion of Step-I of registration, in any branch of State Bank of India only. The „Cash Deposit Receipt‟. Applicants have great chance to get jobs High Court of Punjab & Haryana Recruitment, however if someone want to ask anything please comment below.